The Titan-T1, it is now the smallest portable computer enclosure in our Titan all-aluminium range. It is built to withstand rugged use, offers limited expansion, can be upgraded and customized using standard off-the-shelve components. T1 is offered with a choice of backplanes, either 2 PCI connectors or as an alternative a combination that has 2 ISA and 1 PCI , with a maximum of two usable slots. Selection of 200 NIT 14.1″ TFT LCD or 15″ 400 NIT TFT LCD with 3mm impact resistance glass protects the display from harsh and unfriendly environments. The Titan-T1 offers an expansion capability rarely matched by other portable computers. Solutions can be easily customized for the majority of portable computing applications where there is a requirement for add-in PC card capability, massive disk drive expansion, and the ability to survive harsh conditions. The Titan-T9 offers seven expansion slots and four open drive bays, the ability to accept the fastest CPUs from Intel(R), and is capable of SCSI sub-system. The key to cost effectiveness and flexibility The Titan-T1 uses standard off-the-shelf components to optimize price without compromising performance. 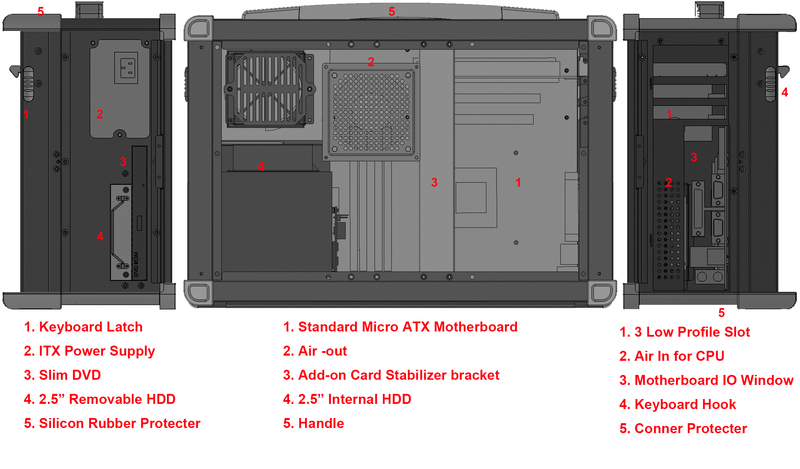 It supports most standard ATX motherboard and passive backplane with 7 or 10 slots for above average expansion capability.